Your view of the broader significance of this weekend's failed Doha summit directly relates, in all likelihood, to your pre-existing view on asset markets. If you are of a bearish mindset, then of course the failure of oil producers to freeze production is bad news, and renders predictions of "supply/demand balance by H2" as little more than a wishcast. The implication, it need not be said, is bearish for risky assets. If you're more constructive, on the other hand, it's easy to say that many asset markets have shrugged off tepid growth and lousy earnings and negative rates for awhile now...why shouldn't they continue to do so? That's a pretty darned high correlation, right? And it makes sense, because of the underlying narrative of financial market volatility via the high yield debt markets due to impoverished shale producers. As such, the 5.6% decline in WTI bodes ill for risky assets, as evidenced by price action in equity futures, FX, and fixed income thus far on Sunday. 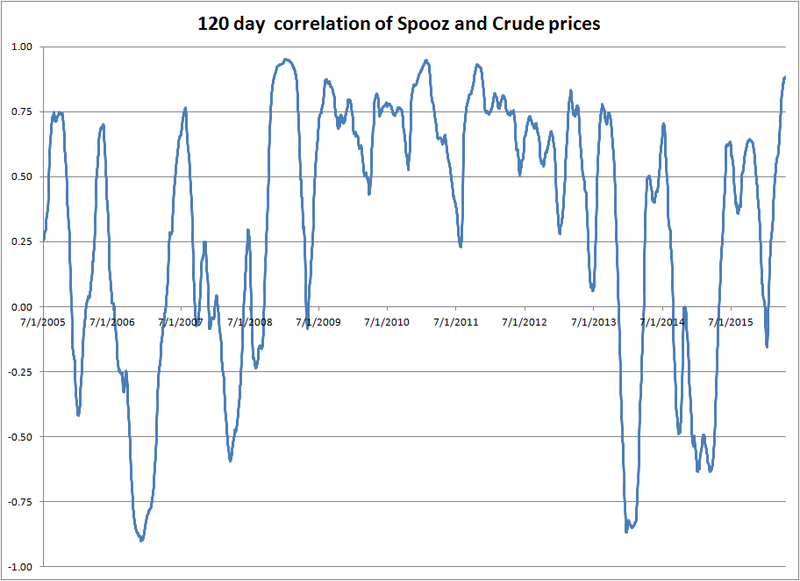 OK fine, but what if we run the same 120 day correlation on daily returns, rather than price? After all, if there were really a strong causal relationship between the two markets, we'd expect to see it show up on a day-to-day basis, right? Or B). The 120 day rolling correlation of returns is actually negative; indeed, it's rarely been more negative over the last decade. That's a pretty darned low correlation, right? And it makes sense, because there are a myriad of factors that impact broad equity markets, of which the oil patch is only a small part. As such, any any moderate weakness in crude this week is actually good news for stocks, as it provides an ongoing boon to the large section of the economy that benefits from low oil prices and will keep the Fed's hands firmly in their pockets. CORRECTION: It looks like Macro Man was working with dodgy data. After getting some fresh data and re-running the analysis, it appears that the return correlation is actually quite positive, which probably does make sense. I guess it's "Doh!" from Macro Man and "ha ha" from readers. Apologies! If you're so inclined, choose the chart and explanatory paragraph that best suits you view. For choice, Macro Man retains his small speculative short in Spooz and does wonder if the Doha thing may just alter the narrative enough to encourage some profit-taking from tactical longs. We could perhaps see similar in BRL, where Dilma's lost impeachment vote could see some "sell the fact" profit taking. Soon enough, Macro Man will know whether to say "Doh!" or "ha ha". Looks like BTFD worked again this morning. 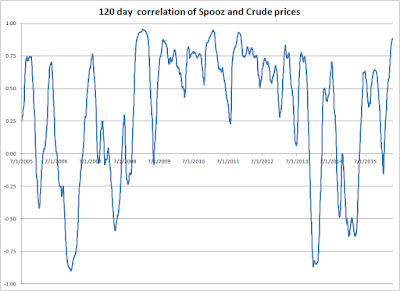 Macro Man, I think you need to double check your numbers on the 120 day rolling daily correlation. I just ran it and see a number around positive 47%. Ran it with different combinations of SPX, ES1, CL1, USO, and got the same result. 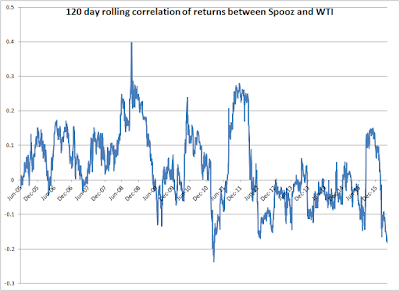 I would be very, very surprised if the rolling correlation were that negative. I did run log returns based on an existing dataset I had. I got a fresh dataset and ran the same analysis, and damned if the new numbers don;t agree with yours. I have no idea what happened here. I did double check because the numbers looked wonky to me as well...dammit. Thanks for pointing it out. @MM - too late - some momentum algo keyed in on your 'bad news is good news' conclusion and ran stops. Kind of ironic given your position. Didn't see this coming in oil and equities. Kuwait oil strike and Iraq govt falling apart at the moment. Have to respect that price action. JPY IMM longs rose to JPY827bn as of April 12th, printing a new historic high in JPY longs on our records, topping the prior historic high of JPY824 in March 2008, in one of the fastest improvements in JPY positioning YTD seen historically” according to JPM. The market currently is full of complacency across a variety of assets but perhaps nowhere is this greater than in the yen and this extreme sentiment may begin working in Tokyo’s favor. Some of the risk off crosses (AUDJPY, CADJPY etc) are recovering most of thier earthquake losses. horrible to see those troll anons were right all along with their repeated calls for higher equity prices. ffs. is reason to pause when you realize exactly 1/2 of anon postings are by people with an IQ of <100. 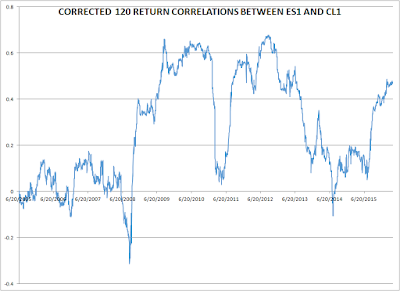 Running correlations on price levels don't make much sense... Just stick to the returns please. Looking at recent price action I have NEVER seen the bears so wrong. Equities are aggressively bought regardless of oil/FX moves. Oil is HUGELY bullish (regardless of news). Looks like we're going to see a massive upside breakout on equities taking out all time highs - maybe the start of a new bull market. This morning has seen my short orders dealt at 2100 and 6400, so I am on the bus. ES 2100? It hasn;t trade there yet...?? if you want another perspective this jorning Europe is back to its 2016 resistance that it first reached when spoos bounced back to 1930 late January. So if you bought equities on February 1st you are making 160 points (!!) on SPX but are barely back to entry level in Europe (!!) after some horrible drawdown that an emotional trader like you would probably not survive. Lastly you did not hear 'hurray' from bears when spx 1800 was being retested and the whole world was pretty scared. I do not know why you are polluting this forum so much with your bullish QE propaganda. The year will be long and i am worried that you might invite inexperienced traders to buy at the worst time and the worst price. I am sure many would appreciate if the perma-bullish anons could tone it down a bit. I am not sure the 'i told you so' posts contribute anything to this very good forum especially at market extrema. anon 10:03 - I'm not sure perma-bearish posts contribute anything, especially when you always get it wrong and lose money. Go buy some equities, make some money and stop being so gloomy. celeriac, I'm in too, short spoos @2100. I'm watching carefully for a top over the next 2 weeks. It is pretty boring. MM: please don't embed sounds in your excellent blog. I was reading your article during a call and pressed the link by mistake. Most embarrassing! For the record, anyone who thinks in single dimensions like "the bears" or "the bulls" has no business commenting here with the adults. Those are sports teams from Chicago, not terms reflective of anyone with more than a few brain cells. @Booger...at least the sound was appropriate for your gaffe. I have a serious question regarding equity indexes. Can someone explain who/what the likely buyers of equities are in these rallies? We seem to have a pattern where equity indexes range, then burst upwards in a strong trend, range again, then maybe another strong burst up. It also appears that most of these 'bullish rallies' happen across global equities (so the buying is not regional). Also small and large-cap rally together. 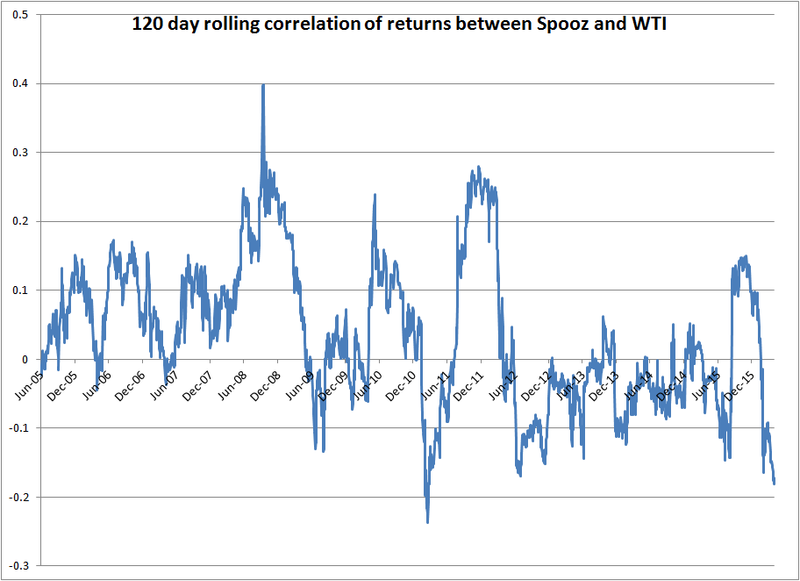 Sometimes the equity rallies are correlated with JPY and/or Oil but often not. The price-action also seems very one-sided: very few pullbacks, just sustained buying. I'm not convinced on conspiracy theories but would v much like to know people's thoughts/explanations for the above. Thanks. PS I have no stance long/short equities, but am an observer. It's asset allocation. A fund or other turning on its machine to purchase a basket over a period of time. Trying not to leave a major footprint by buying at a slow pace. anon 10:03 here. if i told you i made a little less than two million euros shorting European equities since April 2015 you would not believe me right? Right. Come on my yacht this summer and i will teach you how to up your size. You are getting restless trading 1 lot i can see that. Now you go buy that 2100 SPX and we talk in a few weeks.